The "AFFILIATION PROGRAM"was created so that like-minded Youth Soccer Clubs outside of Southern California could share in our accumulated wealth of information, know-how, international relationships and resources. Launched in 2008, TFA began providing a multitude of benefits to Youth Soccer Clubs based outside of Southern California utilizing the "Affiliation Program" as the conduit. The program offers many benefits such as: Access to our secured “total futbol” library of curriculum's and videos; our International Coaching Clinics; Annual Trips to Barcelona as well as our Marketing and Apparel agreements. Multiple TFA Affiliates represented by one central corporate entity enjoy the benefits of the collective bodies activities and are accomplished more efficiently and properly managed through one common centralized program. As a youth soccer organization that strives to support the concepts of "total futbol" in terms of player development according to its unique methodology, it is a must that we properly educate our coaching staff. We can accomplish this by immersing them in the philosophy through the sharing of our library of curriculum's, videos & instructional clinics. By promoting one soccer methodology and player development strategy (ie: “total futbol”), a common soccer ideology will be shared by all TFA Affiliates. 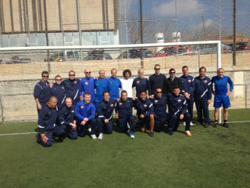 All TFA affiliated coaches can participate in our exclusive week long Coaching Clinic in Barcelona, Spain. Participating coaches will also be given the opportunity to observe evening training at the famous "La Masia". In conjunction with the exclusive coaching clinic, travel teams, families and friends can also participate in the annual week long Club trip portion. Travel teams will also participate in the daily coaching clinic. Click for more info.